Several roots, herbs, seeds and grains are known for their medicinal properties called thuốc bắc in Vietnamese. There's a Vietnamese dessert that gathers a collection of these delicious ingredients known as healing in Asian culture. 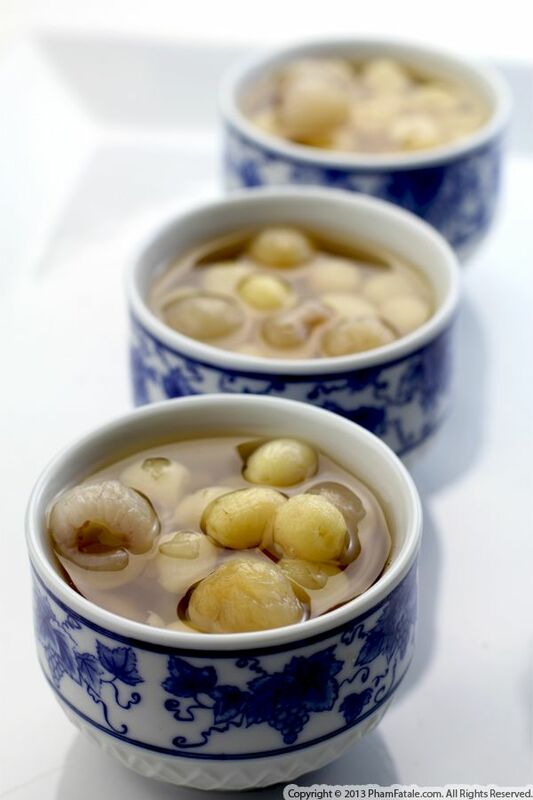 It's called chè sâm bổ lượng and consists of a mix of dried lotus seeds (sen), longans (nhãn), Chinese pearl barley, dried mung beans, dried jujube (táo tầu in Vietnamese, also known as Chinese dates), dried white fungus and ginseng roots. 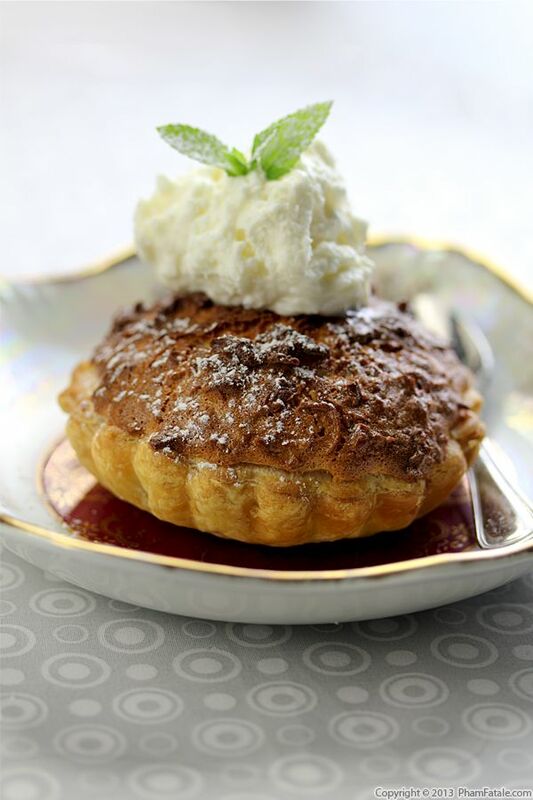 The natural starch from the barley thickens the dessert. Even though the jujube and longans are naturally sweet, I added a bit more sweetener to the syrup of the dessert with Chinese rock sugar. On hot summer days, you could also serve this chilled with crushed ice; it's amazing. First of all, chúc mừng năm mới (Happy New Year of the Horse!). A new, fabulous year is beginning, and to celebrate, I started the day very early this morning wrapping and rolling a lot of vegetarian eggrolls to ring in the New Year! 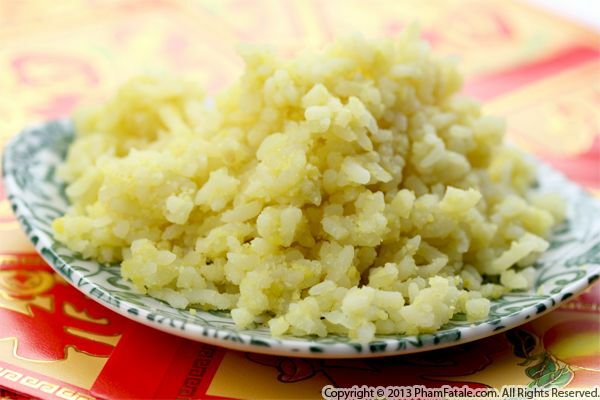 I also prepared xôi vò, which is a popular Vietnamese snack consisting of coconut milk sticky rice and mung beans. Cậu Hoà (my uncle) is going to be stopping by today and I plan on serving this to him with green tea. It's his favorite. 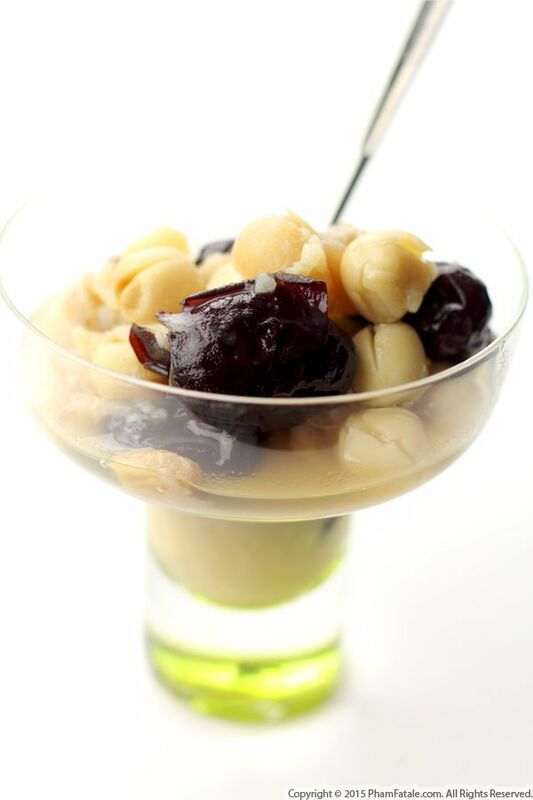 Xôi vò is a very simple, easy snack to prepare. Simply soak mung beans (hulled and split yellow beans) and sticky rice separately ahead of time, then cook and steam the pandan-scented rice, coconut milk and a sprinkle of sugar. That's it. If you're Asian, you know how lightly sweetened Asian desserts are. If you're like my husband, "lightly sweet" is an understatement and you probably won't call this a dessert. Again, I guess it's a cultural thing. If you’re tasting xôi vò for the first time, consider it a nutritious, fragrant snack with a light hint of sweetness that pairs wonderfully with tea. 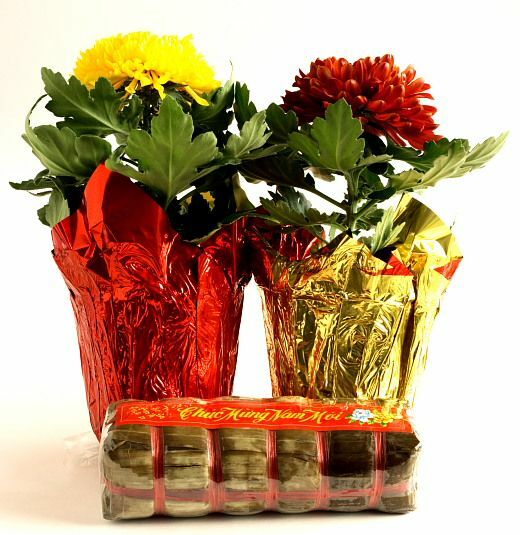 We're a week away from the Vietnamese New Year celebrations (called Tết). I've decorated the entrance of our home with cherry blossom flowers that I decorated with red envelopes that contain "lucky money", called lì xì. I've also picked up brand new dollar bills and placed them in the red envelopes to give to children. The tradition dictates that the first morning of the New Year, adults congratulate children on becoming a year older by giving them these lì xì envelopes. Many Vietnamese desserts are served as well, before "offering" them to ancestors. I've gathered some of the Asian sweets that are prepared for this celebration.